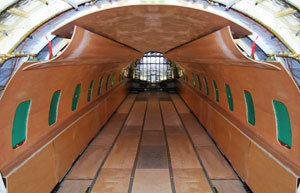 Custom manufactured composite parts for aircraft and marine industries. View of TCC interior shell kit installation. Courtesy of: FLYING COLOURS CORP.
Technical Composite Corporation is a full service composite shop that can accommodate both production and custom composite work. We can work with customer provided specifications and drawings or our in-house engineering team can work with you to produce product from conception to delivery. Founded in 1999, Technical Composite Corporation has become a well established composite shop within the aviation industry. Our in house engineering production and quality assurance offers a “One Stop Shop” for any composite application from concept to finished product. Now celebrating its tenth year of operation, TCC continues it extensive expansion program initiated in late 2007 by adding new equipment and growing employment opportunities. In spring of 2009 TCC added a SDM Laminator 600HD Panel Press to our existing multi-oven inventory to meet any request for flat panels large or small. Located next to the San Antonio International Airport, our 25,000 square foot facility stands ready to meet any order. As a subsidiary of Lou Martin & Assoc., Inc., TCC has full access to an on-site DAR representative. Also included is the ISO9001:2001 certification that LMA is currently pursuing which will additionally cover all aspects of AS9100 standards.